There are some who, when they hear the word ‘missions,’ have images of seminary-trained, multilingual, and theologically-adept men and women bolting into places around the globe as missionaries for the gospel. While that is true in many respects, it is only a partial truth. Missions also includes “regular Joe’s” – men and women who aren’t seminary trained, speak only their native language, and maybe still fairly young in their faith. Indeed, one of the great ways to jump start your spiritual growth is by, as we like to say at CCCC, getting on foreign soil in the name of Jesus. Last week I returned from a trip in which truly anyone, regardless of their level of expertise, spiritual growth, or theological maturity, would have been blessed. The team from CCCC distributing food to the children of Mogote, Honduras. I, along with eight others, traveled to Tegucigalpa, Honduras, to minister to the people of Mogote, an extremely impoverished area outside the capital city. 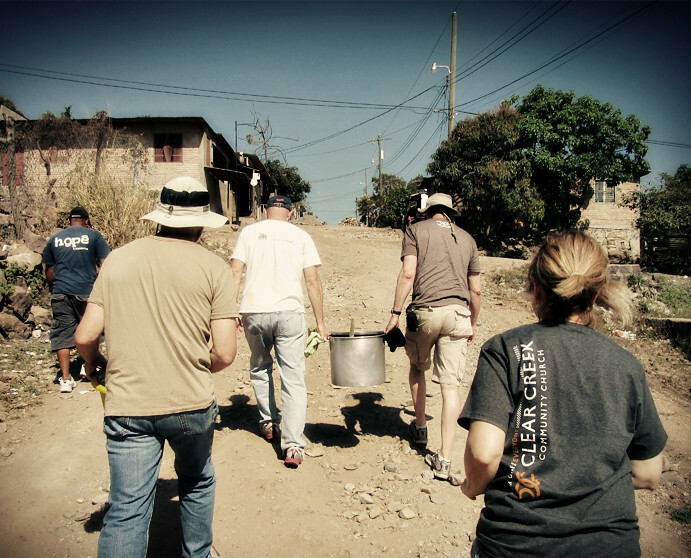 We were the guests of Hope 4 Honduras and served alongside their everyday ministries. Over our week’s stay, among other things, we helped build a house (and latrine), distributed bags of cooking ingredients to the surrounding colonias (subdivisions or areas within Mogote), and gave out hot meals (tortillas filled with beans and rice) to waiting children as we walked the streets. Did you notice something about those activities? They aren’t dependent on the depth of your expertise but your servant-heartedness. No seminary degree is needed to pass out food. No training is needed to fill bags with rice or corn. Even in building a home (which essentially was four walls and a roof) our team was provided both materials and professional guidance. In fact, there were many times I thought to myself, “This mission doesn’t need my help. They do this every week. Frankly, they could do it more effectively if I wasn’t here.” But that would only be true (maybe) if the sole objective was to minister to the people of Mogote. The other objective was to help us see that missions is something everyone can do. That’s why the aim of trip was both to help the needy around us in Mogote and the needy in us as a team. What need in us? Our need as Creekers to be on foreign soil in the name of Jesus. So, if you’ve never thought about going somewhere around the world to minister to others in Jesus’ name, let me encourage you move past the excuse of inadequacy and embrace the gift of opportunity that lies in our Go Trips. Think of missions not only as a way we share the gospel of Jesus with the world but also as a spiritual discipline for us, something God will use by his grace to grow us in him. The only thing needed is a willing heart and an expectation that the Lord will seek to work both through you and in you!